The opportunity for St. Louis Blues defenceman Colton Parayko to be mentored by Hockey Hall of Famer Larry Robinson this season has been the chance of a lifetime. The 24-year-old Parayko already had established himself as one of the premier young defenders in the game. But now he has Robinson watching over him. The 66-year-old Robinson joined the Blues last summer as a senior consultant to hockey operations. He is a nine-time Stanley Cup champion (six as a player with the Montreal Canadiens and three more as head coach/assistant coach with the New Jersey Devils), a two-time Norris Trophy winner, and the Conn Smythe Trophy MVP from the 1978 playoffs. Periodically, Robinson will stop by the Blues dressing room for a chat and some instruction. It’s advantageous for the 6-foot-6, 230-pound Parayko to have a sage who can look him in the eye like the 6-foot-3 Robinson. Recently, Robinson has provided pointers to Parayko on how to defend harder on opponents in his own end and shooting tips. To say Parayko has improved over the past several seasons is an understatement. Thanks to a growth spurt and a diligent work ethic he has gone from being the seventh defencemen on the Alberta Junior Hockey League’s Fort McMurray Oil Barons at age 17 all the way to one of the game’s best young players. In between, Parayko’s path was not one often skated by a pro hockey player. Parayko had gone unnoticed in his draft year at age 18. But Blues Western Canadian scout Marshall Davidson, the brother of former St. Louis general manager John Davidson, had kept a watchful eye on Parayko. The Blues were the only pro team interested in him. So Davidson took the teenager to lunch to find out what kind of person Parayko was. Davidson liked what he discovered. The next contact Parayko had with the Blues was a phone call from another Hockey Hall of Famer, St. Louis executive Al MacInnis, on the second day of the 2012 draft from Pittsburgh. MacInnis informed the young defenceman that the Blues had selected him in the third round (86th overall) at the 2012 draft. But before Parayko turned pro he accepted a hockey scholarship with the University of Alaska-Fairbanks. He was convinced to join the Blues organization after his junior U.S. College season, but was determined to finish his business administration degree in his rookie season with the Blues by taking three online courses in the fall semester, two more in each the spring and summer semesters. 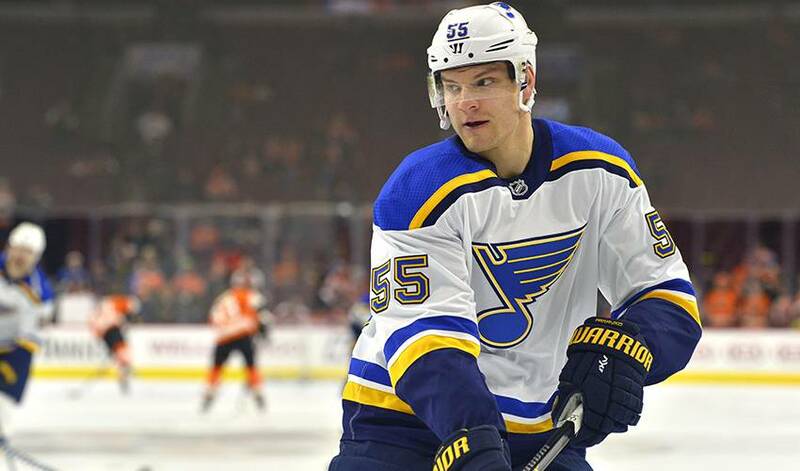 His studies did not hinder his on-ice development as Parayko helped the Blues advance to the Western Conference final against the San Jose Sharks and he was named to league’s all-rookie team with the likes of Connor McDavid and Jack Eichel. Parayko graduated in August of 2016 and a few weeks later went off to training camp with the Team North America young guns team in the World Cup of Hockey. His second season with the Blues concluded with a stint for Canada at the 2017 IIHF World Championship in Paris, where Canada lost in the gold-medal final to Sweden in a shootout. Parayko, who has one of the hardest slap shots in the league, scored three goals and seven points in six games for Canada. “It’s happened so quick,” he said. “It’s been quite the whirlwind for sure. Obviously, going from tier II junior to college to the NHL has been a thrill.